If a picture is worth a thousand words, a video must be worth about a million. Get to know The Conservation Foundation a little bit better through words, pictures AND video by exploring these links. We are fortunate enough to have our mission come to life in print and on the screen thanks to the dedicated partnership of Sikich Graphic Design and Marketing of Naperville. Each year Sikich donates the production of an inspiring video. They’ll make you laugh, they’ll make you cry, and they are all spectacularly done. 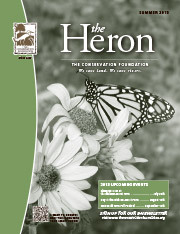 Sikich also donates the visual layout of our three yearly issues of The Heron magazine, as well as several other pieces throughout the year. Their generosity coupled with the in-kind printing donation of Integrated Graphics of Batavia makes it possible for us to continue publishing The Heron. We sincerely thank both of these valuable partners.